TOKYO, Oct, 31 2018 - (JCN Newswire) - DENSO Corporation (DENSO), the world's second largest mobility supplier, today announced it will establish a new facility at Haneda Airport in Tokyo to develop and test automated driving technologies. The facility, which is expected to be complete by June 2020, will feature a building and proving ground for mobility systems R&D and will advance DENSO's worldwide efforts to create a future that's safer and more sustainable for all. 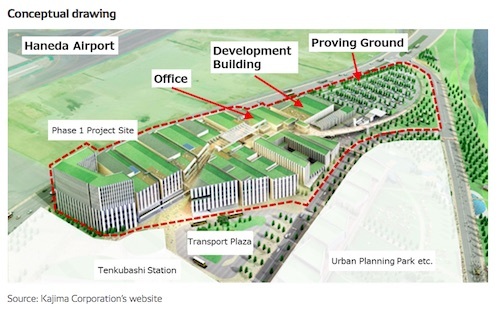 This new location is part of the Haneda Airport Unused Land Zone 1 Redevelopment Project, a broader initiative led by Tokyo's Ota City, DENSO and other entities to transform underutilized space at the airport into a hub for leading-edge technology development and mixed-use cultural facilities. This announcement follows DENSO's establishment of its Global R&D Tokyo facility In April 2018, an automated driving R&D office near Shinagawa Station in Minato City, Tokyo, to promote collaboration and open innovation with its development partners, which include automakers, universities, research institutes and startups. The new facility will include a building to develop prototypes and maintain test vehicles, and also a proving ground to conduct live, in-vehicle tests. This will enable DENSO to take an integrated approach to the development of automated driving in Tokyo because the new facility at Haneda Airport can develop and test prototypes based on automated driving technology planned, researched and developed by Global R&D Tokyo in Shinagawa. The Haneda area is designated a National Strategic Special Zone, where a regulatory sandbox system(1) is adopted to allow for field tests of advanced mobility technologies on public roads, including automated driving. Additionally, the Haneda area in Ota City is a hotbed for developers, startups and manufacturers of new-age technologies and applications for a wide range of use. DENSO will utilize the National Strategic Special Zone system and work with manufacturers in Ota City to develop and test prototypes more seamlessly and speed development of automated driving technology. DENSO will continue to develop technologies and products in the fields of safety and the environment, to help create a new mobile society to improve people's lives. A system to create a controlled environment without existing regulations where a limited number of project participants can verify their innovations including new technologies during a limited period of time, in order to collect data to rapidly obtain test results and determine if regulatory reform is needed.